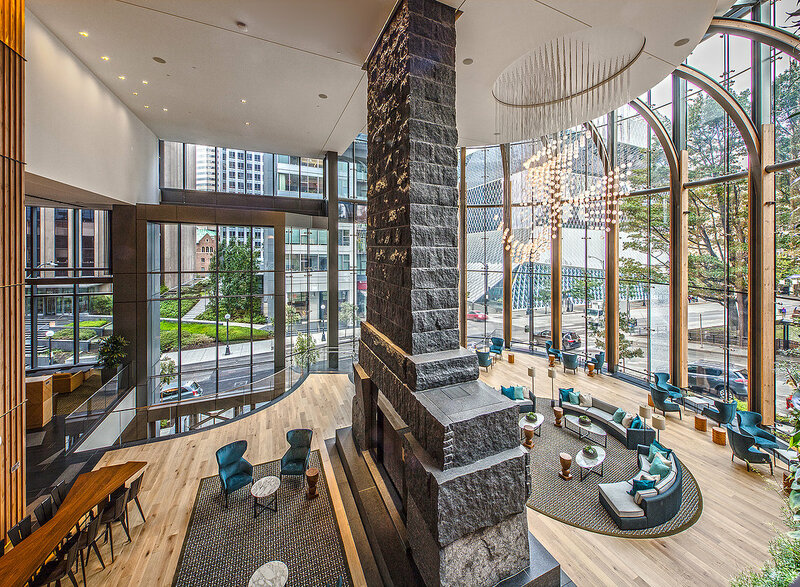 Have you checked out the new Madison Centre building in downtown Seattle, WA? The interior, exterior, layout, and tenant amenities are nothing short of amazing. Originally planned during the 2000s, this project was put on hold during the recession, then revived by Schnitzer West in 2012. Demolition of the pre-existing buildings on the site began in 2014 and the tower (11th tallest in Seattle) opened for occupancy in October 2017. – It’s considered a Class A Office Building, the highest quality building in their market. – Houses 37 above-grade floors with 754,000 square feet of office space. – Offers 7 levels of secure, in-building parking and 148 bicycle stalls. This innovative corporate campus is designed from street to sky to help tenants attract top talent and maximize productivity. An ultra-modern glass structure from the exterior, upon entering the building, you’re greeted by its signature Madison Rotunda soaring three stories from floor to ceiling. This makes for an incredibly bold first impression. 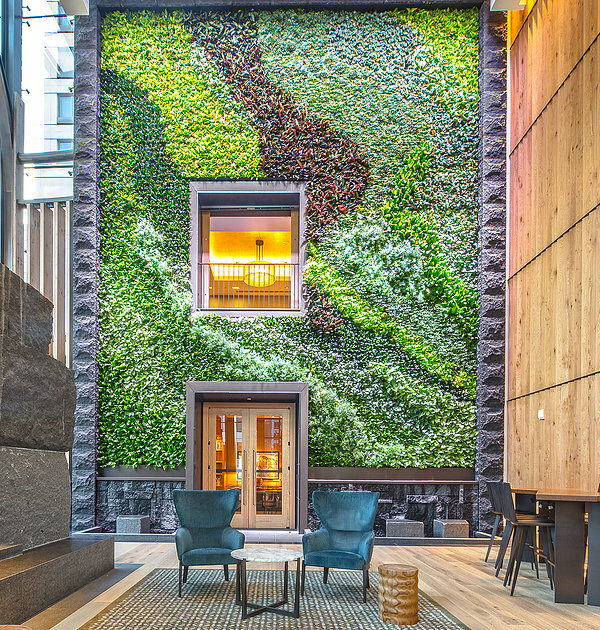 Housed within the Madison Rotunda is a fireside lounge and an artistically arranged living wall comprised of 5,000 plants, welcoming guests while improving air quality, reducing noise, and relaxing visitors. Boasting a library, 5th avenue study, private rooms, a conference/training center, and Madison boardroom with deck, one of the most eye-catching spaces within this iconic tower is the very top! 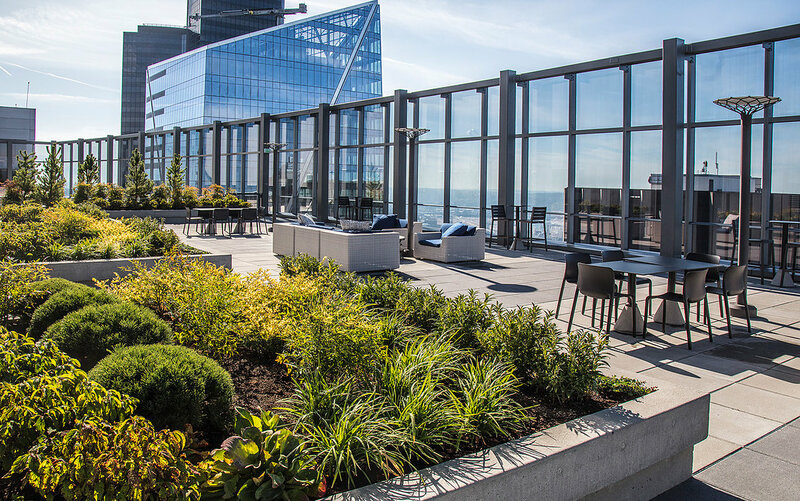 Madison Centre’s rooftop terrace is truly one-of-a-kind. With its breathtaking views of Seattle, Elliot Bay, and Mount Rainier, this beautifully landscaped haven is reserved exclusively for tenants. The deck features 15-foot glass wall to shield the space from the wind and a number of designated outdoor meeting areas and quiet spaces, perfect for focus time or quiet inspiration. If the space itself wasn’t enough, the designers behind Madison Centre have thought of every amenity to make their tenants as comfortable and productive as possible. – There’s a premier coffee shop on site. – There’s a 5,000-square-foot REV Fitness Center powered by the Washington Athletic Club with spa-like locker rooms. – 4 reservable quiet rooms for nursing moms, prayer, or meditation. – Shared cafeteria between tenants. – Heck, the elevators even move 1,200 feet per minute, carrying a guest from the ground floor to the roof in 24 seconds! Atlas Networks Gigabit Internet Service is available to any new tenant within this state-of-the-art building. We currently serve as the Internet Service Provider for Madison Centre tenant Textio, a very cool startup assisting major companies around the world write highly effective job listings. We manage Textio’s wireless network (learn more about what working with a managed wireless provider really means) and help enhance their productivity with fast and reliable internet from a locally based service provider. Are you thinking about switching internet providers? If so, feel free to visit us online or contact us anytime. We’d love to learn more about your commercial or residential project and identify how we can help!